I’m love with chippy, distressed and worn pieces of furniture. Did you know that you can recreate a multi-color, distressed, “chippy” patina in just a few easy steps? This simple distressed paint technique is perfect for the weathered coat hooks I found on the side of the road. Turning a freshly painted finish into something that looks authentically old. Love it! 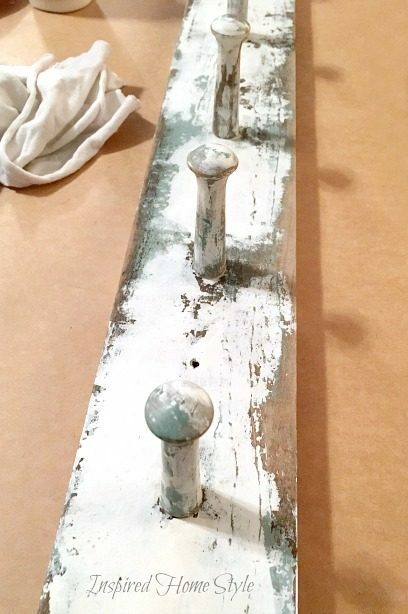 My coat hooks already had a beautiful weathered patina that was just begging for a beautiful layered patina. However, if you are starting with new wood, you will want to age it first. 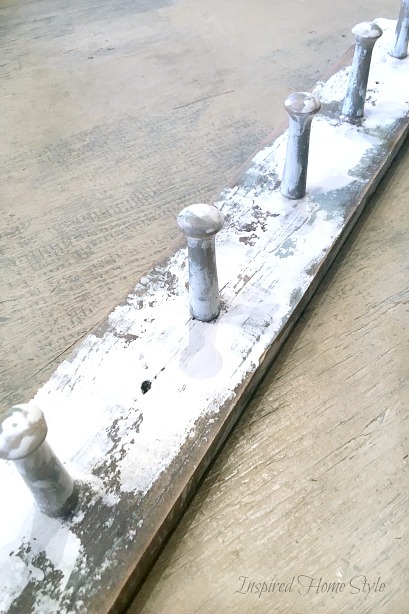 You could do this by painting it with a quick undercoat of chocolate brown, staining the wood or using steel wool soaked in vinegar. Once you have a base layer, it’s time to create a perfectly aged finish by layering and distressing the paint. Grab your spatula and ready to paint! 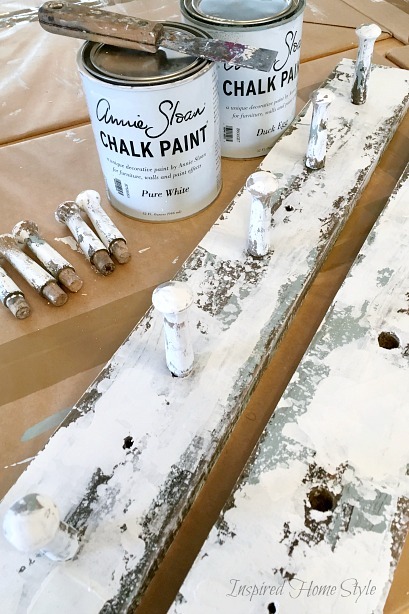 Paint in a couple of colors ~ I love Annie Sloan Chalk Paint, but any paint should work. I chose to keep it simple and only use 2 colors of paint. I used Duck Egg and Pure White Annie Sloan chalk paint. 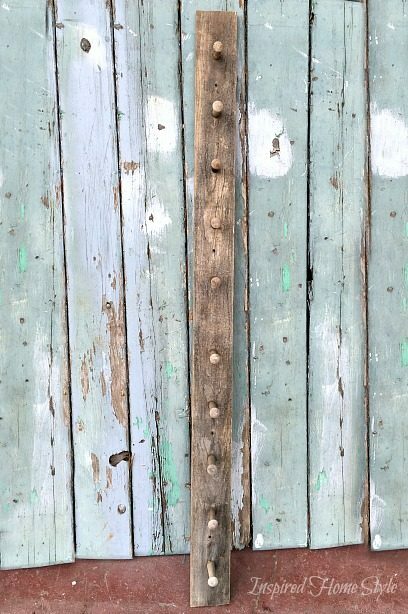 However, any number of your favorite colors will work to make the appearance of layers and layers of old paint. Are you wondering why I chose to use a putty knife instead of a paint brush? I wanted a finish that had an authentically old look…uneven coverage without the brush marks. Plus it reminded me of icing a cake, which is always fun right? Start by scraping a thin layer of paint over the entire piece. I found that thick paint works best for this. I just poured a little paint onto a plate and let it air dry and thicken a little before using it. Notice that there are lots of areas where the wood is still showing through the paint. Thats what you want. You are not painting the piece, but scraping the paint on. 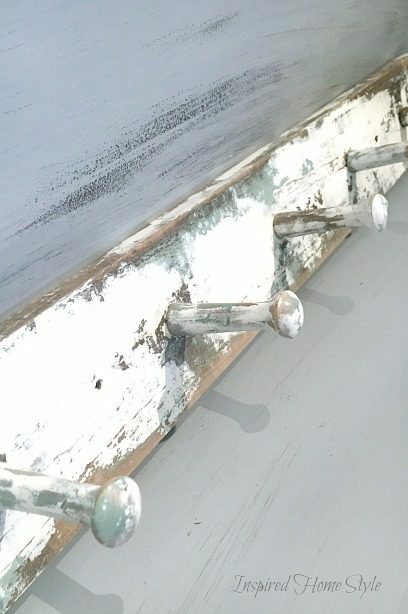 Thin coats are important since you will be adding several colors and you don’t want to get too much paint on your boards at one time. Once the first layer is dry, you can scrape on another color. 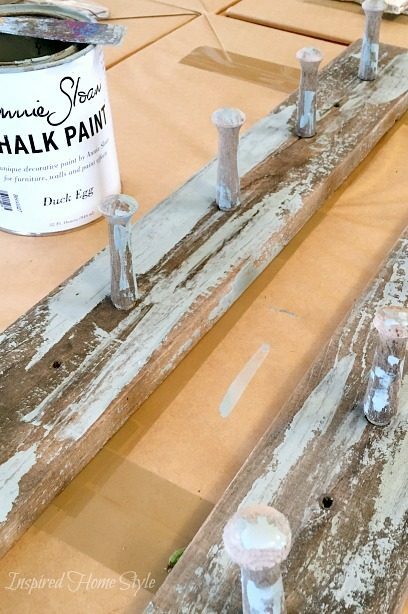 Apply as many under colors as you want, although make sure each layer of paint dry completely. You don’t want the colors blending together. When the piece is completely dry, use a paint scraper to remove random “chips” of paint, allowing the previous colors to show through. Then sand the edges and random areas down exposing all of your sub coats creating a “multi-tone chippy” look. 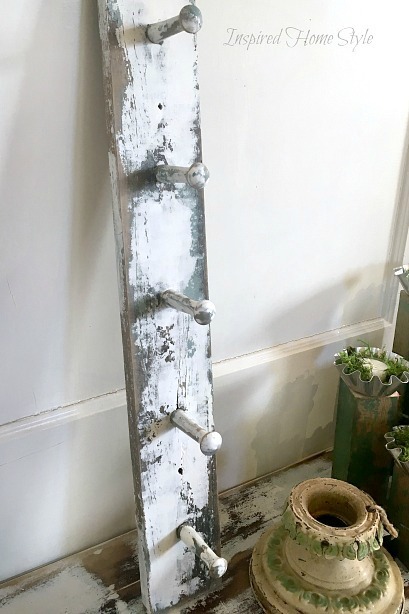 It has that look of a piece that has been painted a few times and each layer has been worn from the bumps and dings of coat, scarfs and bags hung off the hooks. Perfection! This entry was tagged Distressed Paint, Inspiration and Ideas, Organizing, Paint Techniques, Painted Furniture, Reclaimed.